70.19% of Aussies have a credit card, according to a study by Finder.com.au, owing around $32 BILLION! It equates to around $4,200 per card. You can check an Australian credit card debt clock on MoneySmart and see how much debt we are in with our credit cards. According to Canstar, the average Australian is in four times more debt than we were in 1988. This debt includes mortgages, investments, personal loans, car loans, credit cards and all forms of debt. Given the price of homes, this probably isn’t surprising. However, even when mortgages and investment debt is accounted for, it seems we are still averaging $20,000 debt each! How do you deal with debt, pay it off and get closer to financial freedom? Before you get discouraged, read how one reader (a friend of mine) and her partner cleared $90,000 debt here, another reader cleared $3,000 in one month here and 6 tips to easily reduce debt here. Don’t hide or live in denial about your debt. Get it all out in the open. Write down every debt you have, how much you owe, how much the interest rate and monthly fees are, any exit fees or early payment fees are associated with it, how long you have to pay it off and if you can remember, write down what each debt was for. Once you have all your debts laid out, decide which one you will tackle first. Most people choose the smallest to get it cleared quickly. Once you have chosen which debt to tackle first, continue to pay the minimum on all your debt while putting all extra money on the one loan to clear it fast. Once that debt is clear take the payments you were making on it and all the extra payments to put on your next debt to clear it faster. Do this with each debt until your debts are all gone. Are there better options with lower interest rates or no interest? Can you negotiate with your current provider to reduce the interest? Getting lower interest and reducing or eliminating fees can go a long way to paying off debt faster provided you continue to pay the debt at the same amount you were before. The bank will reduce your repayments along with the interest so the amount of time you are paying it off is the same. If you keep paying the debt at the higher amount you were before, you will clear it sooner. Be aware, applying for credit will impact your credit score and credit history. Don’t go applying for a bunch of loans at once. Talk to a financial professional or at the very least, do your own research and select one to apply with. I do this with savings, however, when I was in debt it helped pay off hundreds extra quite quickly. Every time you check your bank account, round down the amount to the nearest $5 or $10 and transfer the excess to your debt. E.g if you have $117.89 in your bank account, transfer $7.89 to debt and you are left with an even $110. Apply this to everything you spend money on, such as groceries. If you budgeted $150 and came in at $136.23 this week, transfer the $13.77 to your debt. Go over your budget and check every area (this challenge will help with that). Are there any areas you can save more in? If so, do what you can and transfer the savings onto your debt. Check out 31 ways to save $200 or more plus ways to make money for some ideas. Sell off anything you don’t need or use. You can find out tips on how to do that plus how I have made over $10,000 a month selling things here. Look at other ways to make money such as getting some overtime at work, look for a second job, do cleaning, gardening, babysitting, sell things online, become a virtual assistant, start blogging or freelance writing. Check out loads of ways to make money here. With any extra money you make, put it straight onto your debt. You didn’t have the money before, don’t spend it now. This way you get used to living without extra cash and once your debt is clear you will be able to save quickly. – Create an emergency fund of $1,000 to $2,000 to use for emergencies instead of falling back on the credit card. – Use a cash budgeting system for a while to break the dependency on your credit card. – Use a 30-day list for impulse buys. Instead of buying whatever it is you want, put it on a list and 30 days later if you still want it, work it into the budget. Remember, something on sale doesn’t save you money if you didn’t need that item! It cost you money instead. 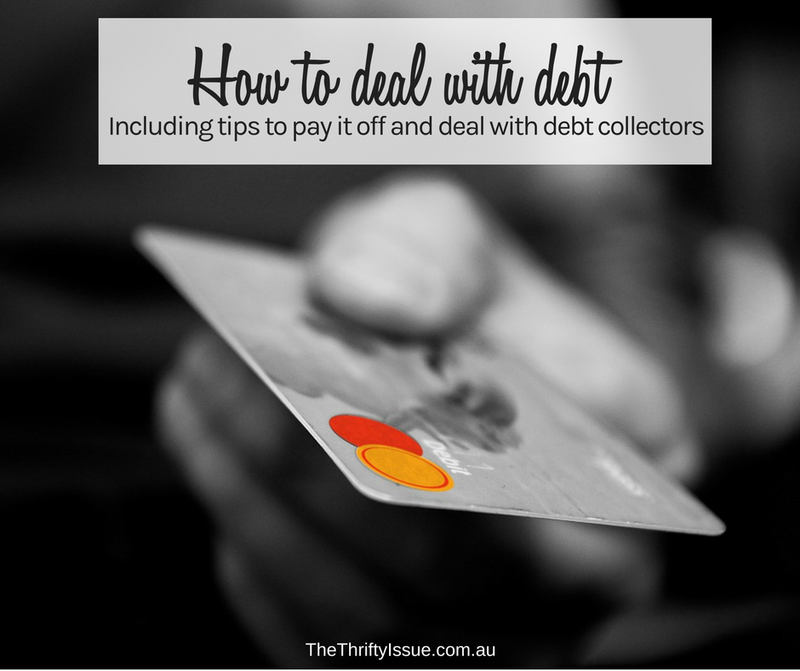 If your debts have gotten to the point where debt collectors are harassing you, follow the tips in this post. My dad was a debt collector years ago and gave me some tips, plus there are tips from other professionals and personal experience (I have helped various friends and family deal with debt collectors). You do not want to spend your future paying for stuff you bought yesterday! How are you dealing with your debt? Changing the debt mindset is KEY! Too many times I hear people say things like “I will always have a loan” or “Everyone has a mortgage payment”. This mentality is unhealthy and can lead to financial issues down the road. Changing that debt mindset is the first step to financial freedom. Absolutely! I hear it so often and people justify their spending with the “everyone has it/does it” but it leaves them in very poor positions financially.